Fund-raising for the LPFM station begins! Beginning today, and continuing for the next 120 days, Delta Star Radio will be doing a fund-raiser via the Fundstarter site. The purpose is to help raise funding to establish a local FM air presence in the local community. I set a goal of $9,150. If/when the FCC grants a construction permit, there is 18 months in which to actually construct the station. Given that we already own the office trailer, studio equipment, and streaming station set-up, I believe it could be done in substantially less time. The programming I am proposing would not involve use of satellite or network feeds, with the exception being a music countdown show and the national news. I am proposing 24 hour operation, wth the bulk of thatprogramming originating from our studios. If you're ready to support a station that aims to be more than a satellite signal piped in from somewhere else, then I urge you to help support this effort. Thank you! I've been seriously considering applying for an LPFM station if/when the new filing window opens. I guess now it begs the question: "Can one more dinky station make a difference?" I later worked at a commercial AM Christian-formatted station. I ended up doing every job there was, working three separate stints over 13 years, including operations manager and later, local station manager. So I understand when a station has to bring in enough revenue to cover payroll, utilities, the mortgage, etc. That station's break-even point was about $5k a month. The average American can no longer afford to own a station, or even try to. Some of us have the know-how and the knowledge of how to make a station work, but the entry level costs are simply too high. Back in 1997, when I was still single and had more resources, I did consider purchasing a local AM station. It had too many hidden liens and other "scary" items that turned up during due diligence, so I did not pursue it. I have not pursued a licensed station since. 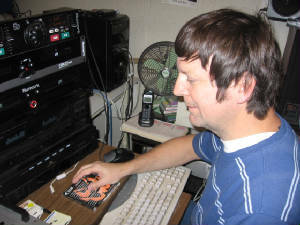 In 2001, I began the first streaming station in Tallahassee. It was "just a fad," people told me. They gave me about six months. On July 9, that stream (now known as Big D Country) turned 10 years old. But as Chuck said, streaming is still not quite there, yet. When the job at the Christian station was nearing its end, I tried to explore other local radio options. At that time, I had nearly 20 years of radio and media experience. I got a tour of Cumulus. Five studios lined up in a row. Four were empty and running on computers. Friendly engineer who proudly showed off the rack room, facilities, and such. It was nice, but seemed cold and sterile, somehow. Not much fun. I never heard back from them, anyway. doing a little over break-even at this point. I've spent the last five years helping raise two step-grandsons, now 6 and 7. They will be home with their Mom this coming year, being home-schooled. GRC's analogy about going to the cave struck a chord, because I'm in a similar boat: At 53, do I want to go to the rocking chair, or do I want to do something else? With the boys getting older and not being with us full-time, I find I'm searching for a new purpose. I've had jobs in and out of radio, but somehow always had a passion for radio. I still have it, apparently. I'm aware of at least three format "holes" in the local radio market. And, there are several smaller communities nearby that have no real "local" radio service. donated equipment, music, and engineering advice and assistance through the years. In return, I have walked countless people and station owners through the basics of Internet radio and answered "how can I stream?" questions for years now. So, I'm hoping the Lord and the FCC will see fit to work in "one more LPFM" because I see this service for what it was originally envisioned to be - an alternative for people who are not being "serviced" by commercial radio stations. Connecting with listeners, one at a time, is what I believe, could make LPFM a shining star. Considering a local LPFM station! With the FCC getting ready to open a filing window sometime within the next several months to a year, I am considering the possibility of applying for a low power FM (LPFM) station. I am proposing more diversity, including the possibility of bringing "positive" country, country and southern gospel, and classic contemporary Christian music into the programming mix. I am already going to bring back one of my former music segments, "Super Southern Gospel Sunday," to the Big D Country stream. I also hold the rights to broadcast "20 The Countdown Magazine" with Jon Rivers. Positive country includes most mainstream country that do not glamorize bar fights, drinking, or activities that undermine family values. So far, the Internet station has launched more than 168,000 listener streaming sessions. I have a studio building that's small but workable, property to place the tower/antenna, and 24 years of experience in radio and media to bring to the table. My nonprofit is well established in the community, as I founded it in 2001. I propose to have the programming locally originated (the exception possibly being a couple of syndicated specialty shows) and operate 24 hours a day. All programming would be streamed. The LPFM service is noncommercial, meaning the station would need to be supported by underwriting announcements and contributions. Thus far, I have been able to secure: two small towers, one is 30 feet and one is 45 feet. They are likely too small, but I'm appreciative of the donation, and time will tell... I am receiving service from both country and now southern and country gospel music labels and distribution platforms. Engineering will cost in the neighborhood of $1000, and the station can likely be built for under $10k. I have some of the equipment, but there would be some additional items that are required by the FCC that are not needed for Internet-only stations. Many of you know that I do play a lot of the top country songs in country music, and a wide variety of classic country. Did you know that I also play a lot of new talent, indie artists, and that I especially look for songs with a positive message? Or that I've gone to several Christian stations that were getting ready to throw away their music libraries? I've managed to get material from two former CCM and one former old country station. If a station that is Christian-owned but offers music to the world and not just the choir members, please consider praying for me as I work through the inevitable red tape that will be required to put such a station on the air. Delta Star Radio of Florida, Inc., is a registered Florida nonprofit, but is not a 501(c)3. Nevertheless, we are eligible to apply for this class of station as long as it is noncommercial. Delta Star Radio of Florida Inc.
We currently operate as an Internet-only station at http://www.bigdcountry.com. Your prayers and help would be much appreciated. P.S. I am legally blind and currently am struggling just to survive on a disability pay. I'd rather be doing radio, and this appears to be the only way that it will ever happen again. If God closes this door as part of His will, I'm fine with that - but I will likely not attempt to obtain a licensed radio station again.